President Donald Trump’s boyhood home in Jamacia Estates is set to hit the market this week for a pricey $2.9 million. The home, which is not owned by Trump or his organization, is decorated somewhat as a shrine to the president, with lots of framed photos of him, a copy of “The Art of the Deal,” and a life-size cut out of the Queens native in the living room. The owner, who bought the property in 2017 for $2.14 million under the guise of Trump Birth House LLC, requests offers be submitted via email, along with proof of funds. The home will then be sold through a closed bidding process, as first reported by the Wall Street Journal. With President Donald Trump back in New York City for the United Nations General Assembly this week, a group of refugees is staying at the president’s childhood home, renting the Queens property through Airbnb. The Jamacia Estates home at 85-15 Wareham Place is being rented by Oxfam, an anti-poverty organization, to bring attention to the refugee crisis (h/t NY Post). The group invited four refugees to talk with journalists at the rental, highlighting their concern with Trump’s travel ban on people from six Muslim-majority countries and all refugees that was introduced in January. After facing multiple legal challenges, the Supreme Court allowed the refugee policy to remain temporarily, but justices will hear arguments about the travel ban on Oct. 10. Since initially hitting the market last summer, Donald Trump‘s childhood home in Jamaica Estates, Queens has seen quite the runaround. After a price chop from $1.65 to $1.2 million, the listing was pulled in November to head to the auction block, but shortly thereafter Manhattan real estate mogul Michael Davis bought the Tudor-style home sight-unseen for just under $1.4 million. He then flipped it for $2.14 million, nearly twice what he paid and double the neighborhood average. Mansion Global now has the scoop that the mystery buyer, whose identity was shielded behind the LLC “Trump Birth House,” will rent it out for between $3,500 and $4,000 a month, on par with similarly sized homes in the neighborhood. 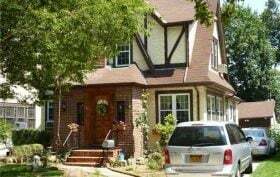 ***Update 7/16/2017: Just one day after it was announced that Donald Trump’s childhood home would be placed on the rental market, DNA Info reports that the Queens property has already found a tenant. Real estate agent Jason Friedman of Coldwell Banker Residential Brokerage told the website that “a long-term lease, for at least a year” was signed “almost immediately” after the home was listed, although for how much is not clear. Friedman shared only that the rent was more than the $3,500 reported yesterday. No word yet on who has scooped up the property. Going, going, gone… Today reports that Donald Trump’s childhood home has traded hands once again, officially selling at auction last week to an undisclosed buyer for an undisclosed amount. 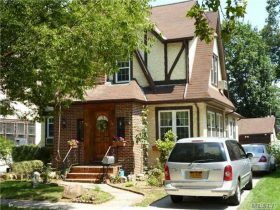 As 6sqft previously reported, the Jamaica, Queens house was purchased by Manhattan real estate developer Michael Davis for $1.4 million in January from a couple who had owned the Trump memento since 2008 (they shelled out just $782,500). Davis’ intent from the outset was to flip the property for a hefty return, and while no auction price has been revealed, early estimates projected a closing figure of around $10 million—much thanks to the Donald’s presidential win (Trump himself even joked about buying it on the Tonight Show). New photos from the auction also give us additional views into the modest Tudor abode. 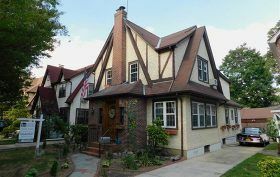 At the end of last month, 6sqft revealed that an anonymous New York investor had bought Donald Trump‘s childhood home in Jamaica Estates, Queens with plans to flip it at auction this month and turn a hefty profit. The Post has now learned that the mystery buyer–and democrat-turned Marco Rubio supporter–is Manhattan real estate mogul Michael Davis. Without ever having driven past the Tudor-style home at 85-15 Wareham Place, Davis dropped $1,390,500 on the piece of Trump ephemera, which he still plans to bring to auction next week. Hoping to cash in on Trump-mania, an anonymous New York investor scooped up the President Elect’s childhood home in Jamaica Estates, Queens in the hopes of bringing it to auction next month and turning a profit. Mansion Global got the news from auctioneers Paramount Realty USA, who say the bidding will take place on January 17th. Previous reports have estimated that the six-bedroom, Tudor-style home that Trump’s father Fred built could fetch up to ten times its most recent $1.2 million ask, or a whopping $10 million. 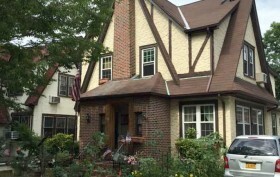 A common question about Donald Trump is “Where did he come from?” and this new listing for his childhood home in Queens may be one piece of the puzzle. Newsday reports that the Jamaica Estates home in which the presidential hopeful lived as a young boy has hit the market for $1.65 million. The six-bedroom tudor home at 85-15 Wareham Place is listed as his address on his 1946 birth certificate (he was born at nearby Jamaica Hospital) and is located in an affluent enclave where the average sales price is around $2 million according to DNAinfo.